Jamie Oliver is a man who needs no introduction. One of the most characteristic features of his food is to bring together fresh and healthy ingredients and whip up delectable dishes. Shows like ‘Just Jamie’ and ‘Jamie Oliver’s Food Revolution’ made him a household name. With the launch of Jamie’s Pizzeria in Ambience Mall, Gurgaon, Delhites sure have a reason to rejoice as he creates magic with his special pizzas. The outlet organized a media launch on 21st October, 2015 and it was a delight to be a part of the event. The pizzeria has a very rustic feel. It is a potpourri of Delhi’s vibrant culture. An entire wall is dedicated to saddi dilli with a collage of different monuments like Lotus Temple, Qutub Minar, etc made with crayons. Indigenous spices hung in a bunch outside the live kitchen where you could see the pizzas being made. Though it is not very spacious, the place has a very cozy feel. The pizzeria is divided into two sections by a set of unpolished wooden doors fixed atop a small wall. Among the starters we tried hand stretched Garlic bread with tapenade. While the garlic bread looked like strips of your regular Naan and lacked garlic, the tapenade was definitely the star of our meal. The Tapenade was made of olives, anchovies, chillies, tomatoes and is sure to tickle your taste buds. The Okra and Lotus root Fritti was served with a green chutney. It was delicious, though more like our pakoras. It reminded of Nadur Churma, the popular Kashmiri fried snack made with long pieces of Lotus Stem. These starters proved that Jamie’s team had strived to incorporate Indian ingredients and flavours into their dishes. Along with this, you can go for Lemon Iced Tea or a simple soft drink to complement your meal. The posters on their wall boasted “our dough is made on site each day with love”. This was indeed true. Jamie’s pizzas have a special crust. The pizza bases were thin in the middle and fluffy at the edges. Unlike other pizza chains, the edges were not at all dry. First, came Courgette Pomodorro with topping like crushed tomatoes, zucchini, baked potatoes and mozzarella. Little blops of mozzarella on the pizza just leave you speechless. The Paneer Piccante Pizza brought together spicy paneer, roasted bell peppers, coriander and mozzarella cheese. This was one of the best pizzas I have had. The Marinara Pizza was simple; crushed tomatoes, garlic and oregano. What I liked about this place is that they have a limited menu. They make only what they are sure of. The limited menu should not be seen as a disadvantage but as a good thing. The brand ensures that all the ingredients used are fresh and that is one of the reasons behind a restricted menu. The freshness of ingredients is quite visible from the glow of the vegetables. Other Pizzas like Delhi Hot and Chicken Alla Diavola are to watch out for. 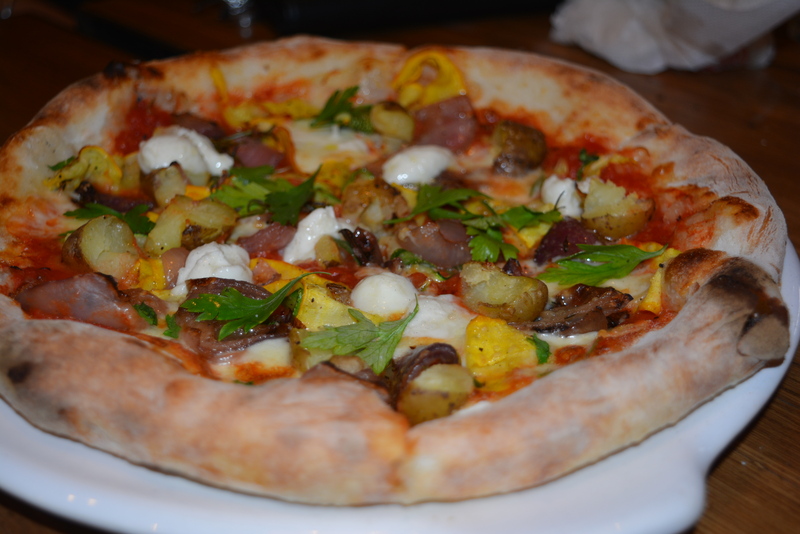 Moreover, the economical rates are another reason why you should give Jamie’s Pizzeria a try. Let Jamie Oliver take your taste buds on an Italian tour!